Stuttgart - FC Bayern Munich extended their 11-point lead at the top of the Bundesliga table as they kept their cool to beat VfB Stuttgart 2-0 in the Südderby. After a first half which tested Bayern’s patience, Mario Mandzukic put them in front before Thomas Müller wrapped things up, with Stuttgart losing Martin Harnik to a second yellow card late on. Stuttgart coach Bruno Labbadia has now lost all eight meetings with the Bavarians since taking charge of the Swabians. Playing in front of the first sell-out crowd at the Mercedes-Benz Arena since Bayern were the guests back in December 2011, Stuttgart had even more pressure to deliver the goods, yet they struggled to live up to the expectations in the early stages. Bayern were quicker into their groove, but found themselves up against a solid wall of white shirts, which presented a formidable obstacle to the visitors, as Franck Ribery discovered with the first shot of the game, a deflected effort after 11 minutes. The Swabians were sticking to a rigid counter-attacking style and it frustrated their opponents, who could do little with their superior possession. Shinji Okazaki worried Manuel Neuer, who was happy to see the Japanese international's volley fly wide of the goal, before Harnik then had the clearest chance of the game so far after a swift breakaway. He pulled away smartly at the back post and sent a powerful header towards goal, but Neuer had luck on his side as he gathered the ball after it struck the post. The two teams emerged unchanged for the second half, and the tactics did not alter either. Stuttgart continued to pack men behind the ball, but a mistake by Cristian Molinaro gifted Bayern with the chance to open the scoring, and it was one they were not going to pass up. The Italian’s weak back-pass was pounced upon by the alert Mandzukic, who rounded Sven Ulreich and slotted in his third goal of 2013 to put Bayern ahead in the 50th minute. Müller had the ball in the back of the net again soon after, but he was in an offside position when he latched on to Daniel van Buyten’s pass. Undeterred, however, he found the net again in the 72nd minute, and this time there was nothing stopping him reeling away to celebrate. Mandzukic showed his unselfish side by chasing down a pass and crossing well for the German international to prod in his tenth goal of the season, effectively ending the home team’s hopes of salvaging something from the game. 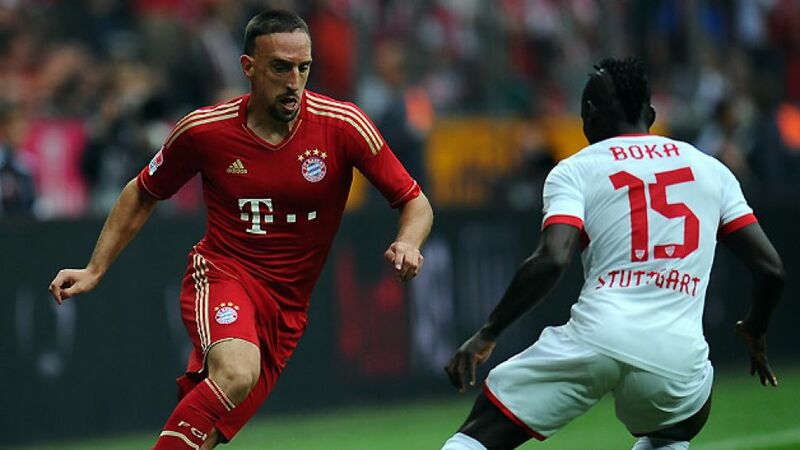 To compound matters for Stuttgart, they lost Harnik to a second yellow card when he fouled Ribery in the 80th minute. Mandzukic then wasted further chances to rub salt in the home side's wounds, but Ulreich kept him at bay to prevent further damage, as most of the Mercedes-Benz Arena faithful decided they had seen enough. Those that stayed saw the introduction of their former darling Mario Gomez, who took the place of Mandzukic for the last two minutes, He had little time to impact on the game, but it mattered little to Bayern, who now lead second-placed Bayer 04 Leverkusen by 11 points.